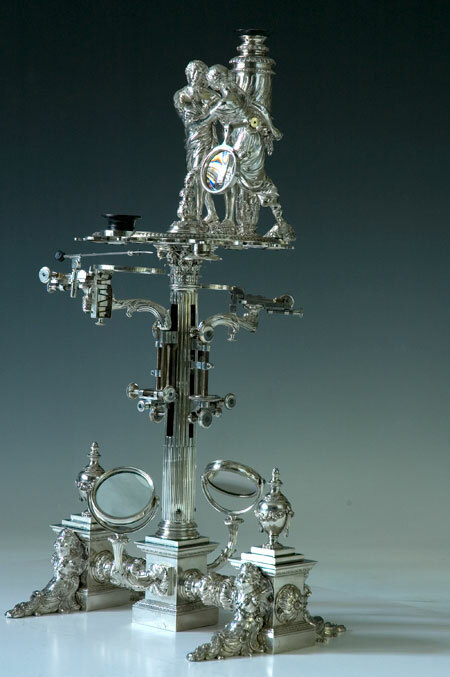 This splendidly elaborate silver microscope was made for George III at the beginning of his reign. Signed by the king’s instrument maker George Adams, it has a fluted Corinthian column as its main support and the architectural programme is enhanced by the two flanking bases ornamented with miniature vases. Although the decorative extravagance might seem to interfere with its function, this was in fact a working device, incorporating both a compound and a simple microscope. It was not only used for the private instruction and entertainment of the king and his children but was also accessible to visitors and widely reported as a symbol of the king’s enlightened tastes. George was instructed in architecture before he came to the throne and remained keenly interested in and appreciative of the art. His principal advisor was John Stuart, Earl of Bute, who instilled in his royal pupil a sense of future responsibility for the encouragement and protection of learning and the arts. On his accession in 1760, George immediately implemented a policy of significant cultural and artistic patronage. In deliberate contrast to George II, the new king began awarding pensions to literary and scientific figures, while undertaking a major programme of collecting, with particular enthusiasms for books, maps, paintings and drawings, medals, clocks, and scientific instruments. The king’s instrument maker was George Adams, a former apprentice of Thomas Heath. His instruments show the king’s encouragement for the combination of architecture and mathematics. However these ingenious devices were divorced from professional practice: they do not seem to have been adopted outside courtly circles.